The Deep Hall (Deep Passage in the PAL-version) is a room inside of the Secret Mine in Luigi's Mansion: Dark Moon. The Deep Hall is accessed by taking the door on the right inside of the Coward's Chasm. The Deep Hall is a large room that connects to many different parts of the basement of the Secret Mine. There is an E-Gate on the north side connected to a conveyor belt. Nearby is a bonfire and a teakettle. There is a hole that Luigi can investigate to look into the Crystal Quarry and another hole that Luigi can look into the see the Cinder Mine. The door on the northwest leads into the Cinder Mine and the door on the northeast leads into the Crystal Quarry. The door on the right side leads into the Pit Mine. During Hit Rock Bottom, Professor E. Gadd instructs Luigi to reach the Deep Hall. Upon reaching the Deep Hall, Luigi must go to the Crystal Quarry, but the door is locked. The only door to go through is the Pit Mine, where Luigi can find pieces of coal that can be used to melt the ice blocking a chain to the Cinder Mine. 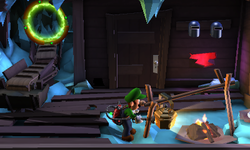 After melting the ice on the chain, Luigi can go into the Cinder Mine to get the key needed to open the door into the Crystal Quarry. If Luigi looks through the hole peering into the Cinder Mine, he sees a Gold Greenie taunting him. After Luigi is done investigating, he trips over a Sneaker. Luigi can capture the Sneaker and the Gold Greenie after this debacle. Once Luigi reenters the room after obtaining the key, he has to fight a Greenie with a welding mask and a Greenie holding a red crystal. In Across the Chasm, even though Luigi does not have to go through the Deep Hall, this mission's Boo is hiding inside the room. The teakettle above the bonfire is missing and must be revealed with the Dark-Light Device. After capturing the Spirit Balls, Luigi must use his Poltergust 5000 to blow the teakettle until it is above the fire. Once the water inside boils and the kettle starts whistling, the Boo pops out. Starting on Hit Rock Bottom and most missions after, there is a sapphire stuck inside of an icicle near the entrance to the Crystal Quarry. To get the gemstone, Luigi must go into the Pit Mine and activate the machine so it drops coal onto the conveyor belt. The conveyor belt takes the coal to the Deep Hall, where Luigi can ignite it with the bonfire and shoot it into the icicle. This page was last edited on September 19, 2017, at 02:50.